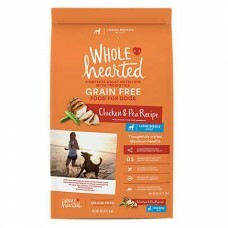 WholeHearted Grain Free Large Breed Adult Chicken and Pea Recipe Dry Dog Food, 25 lbs. The WholeHearted Grain Free Large Breed Adult Chicken and Pea Recipe Dry Dog Food provides all the nutrients necessary for your large breed pup in every delicious bite. This antioxidant- and vitamin-rich formula contains glucosamine and chondroitin to support healthy joints, which is especially important for large dogs.